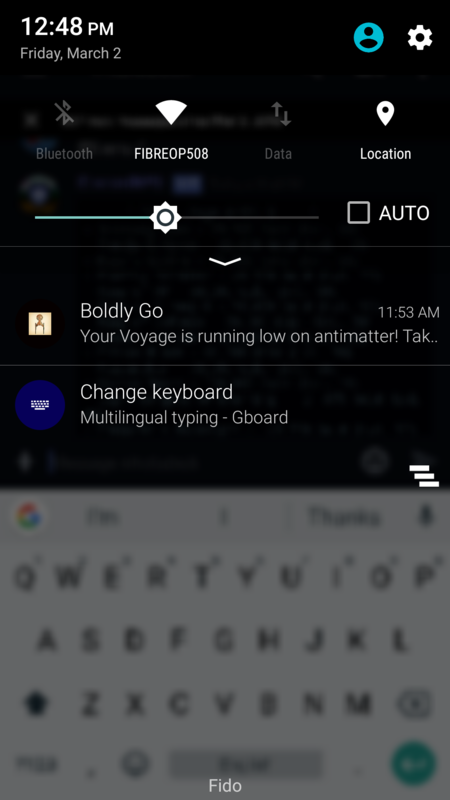 My phone (Android OS) is not receiving voyage notifications (Low AM or Dilemma, or Completed). At least one other member of my fleet reported the same issue, unknown what his setup is. Odd...just now was the first time I've seen a voyage notification in a long time. Good thing, or I would have forgotten to recall on time. Mine are still coming, but the timestamp is 2 hours old. Seeing similar since the update - notifications seem to arrive about when they should but with a 2hr old timestamp and they fail to trigger the standard notification alerts (vibrate and a noise alert). Other app notifications work correctly so this behavior is unique to the updated Star Trek Timelines. This is the problem I'm having as well. Notifications come, but they display as visual-only. No tone or vibrate. Which is of course useless unless you happen to be staring at your phone. I also am not getting any tone or vibration when I recieve a notification for voyages and shuttles since the update. This is frustrating as i have missed multiple voyages running out of anti-matter. Just wanted to add another notch to the list. Not getting notifications for voyages or shuttles since update. Well not the important ones (sound/vibrate) on android. Same here - missed two points where my antimatter ran out and if it weren't for the fact that I'd picked up a super-rare that I needed, I would have abandoned ship! Android, no sound or vibrate alerts - and visual alert appeared AFTER I'd spotted the AM had run out. Wanted to update the problem as it continues to happen. I just waited and watched closely for an impending Voyage notification, and it launched again without any tone or vibrate. It also was logged as "one hour ago" right at the time of release. I don't know why the time error is happening, but maybe this is why the device isn't triggering the usual notification sound alerts, it thinks that this was already posted an hour ago? Something to look at fixing, DB. I’ve never had sounds with any of my notifications for this game. It’s always been annoying. If you are getting notifications that say they are an hour old, it could be because the time stamp is off. For some reason on my phone, the time stamps for text messages are 3 minutes head of actual time, so if I get a text message, it says “in 3 minutes” for the time, which I always joke I’m getting messages from the future. But seriously, were people getting sounds with their notifications before? Those would have been nice to have been getting. Yes. Prior to this update, any game notifications worked like any other app or text. Tone and/or vibrate depending how my sound settings were, uh set. With other apps, I beleive you can choose if they just post a notification without sound or with sound(same with vibration, you just have to dig into your notifications). This is the way shuttle returns, voyage returns, voyage low on anti-matter, chron full alerts, voyage delema, and messages expiring notifications have worked in the past for me. At least those are all the ones I have gotten. Since the update I have missed at least 3 voyages running out of antimatter because of this issue. That is dil I have lost. I get some notifications, but they are LATE, with NO vibration or sound. I have tried toggling notifications to fix the issue, my clock is correct, I have restarted the game and my phone multiple times. Still not getting notifications like I was BEFORE the update. Please fix this. I am running the game on a Galaxy S7 edge and this is highly frustrating. I am having both issues. The Dilemma notifications are coming through as 2 hours old (around when they should do). However, the Low AM/Voyage at Risk notifications have stopped coming. The Low AM alerts are pretty important as they allow me to recall a voyage without sitting watching the AM count down on a voyage for hours on end. Can we please get an acknowledgement of this being an issue? I am trying to avoid sending in a ticket about this problem, but it is very aggravating to deal with. Especially with a faction event coming up where catching shuttle returns is important. Same here.. also for shuttles returning; no notification then either. Please be sure to submit tickets on these issues. with as much device-specific information as possible. We are not able to reproduce it internally, so there must be some external factors we need additional information on. Your tickets will be a great help in getting this resolved. Thank you for the response @Black Pebble. I have submitte a ticket with as much detail as possible. Let us know if there is anymore specific info you need. I've noticed that since v4 came out, the notifications for shuttles and voyages show the wrong time. Shuttle notifications always say they occurred 3hr ago, Voyage dilemmas say 2hr ago, and Voyage antimatter warnings are whatever time since the last dilemma. I'm running Android, Moto X Pure (3rd gen) and NVidia Shield K1, both running v7. Edit: Which...we now seem to have been melded to. Since the forced update, Voyages have been broken. Notifications are pushed back two hours, so you'd better be on-the-ball with when to recall, since it won't tell you you're running low on anti-matter until TWO HOURS AFTER YOU'RE LOW ON ANTI-MATTER. I've lost THREE voyages, and subsequently a good amount of honor and chronitons over this now. We as players had become accustomed to the notifications ACTUALLY working. Now they don't, and we're expected to once again keep track of it ourselves for some reason. Just a heads up to anyone else, and DB, you need to fix this. Note the time differences. My shuttle notifications work just fine, however. Has anyone received a response to their ticket regarding this issue yet? I received compensation for the original voyage that was affected, but haven't heard anything since. I received no compensation for the 3 voyages that I have missed recalling due to this issue. I did get a response saying that CS was going to monitor this issue, but that it only a small portion of the player base was experiencing this issue. So basically we are stuck with this problem was my take on the CS response, unless someone in the know here can elaborate further on how this problem is being addressed beyond "we are monitoring data". Same here. Makes Voyages so painful now, back like they used to be before the notifications were originally fixed. Now have to constantly watch it near the end, so frustrating. Clearly it was bad karma to post that earlier, because I just forgot about the problem again and failed another one. Not submitting a ticket this time though, since it's an issue I was already aware of. So mainly my fault now. I just wish they'd fix this! Possibly a stupid question Black Pebble, but have your team looked at whether this might be caused by a timezone differential and that might be why you've been unable to reproduce it in house? It would also explain why different people seem to be seeing different offsets showing in the notifications, I get 2 hours whereas Grant77's image shows they are getting a 1 hour offset.